We have noticed a big increase in job leads coming from Enfield and Barnet in North London, lots of window replacement glass units are required in these North London towns. We receive a high volume of phone calls where clients describe there steamed up double glazing issues that they are experiencing. This is when water and condensation appear to build up between the window panes. 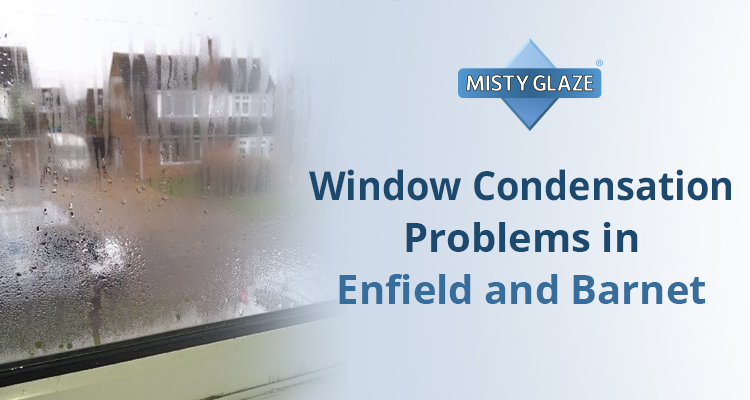 Window Repairs have never been so affordable for the residents of Enfield and Barnet. Our process is always the same when carrying out a double glazing window repair. At first we book a convenient time slot to inspect the window replacement glass, or we could also price the window repair request via email. Then we can estimate the actual costs involved to replace the steamed up double glazed unit, as we are a local double glazing window repair company operating in Enfield and Barnet, we can promise our prices will be very reasonable and competitive at Misty Glaze. Window condensation is very frustrating when trying to clean the affected panes, no matter how hard you try to clean the water and stains between the panes, it will never correct the problem, unless you have window replacement glass. We are very pleased that we can offer Enfield and Barnet a chance to restore there existing frames, with this simple, clean and affordable window repair. For your free quotation please fill out the form, and don’t forget, if you want a quick same day estimate, we can also provide Enfield and Barnet with our rapid double glazing window repair email quotations. Why not give Misty Glaze a call today, and let the local experts take care of your window replacement glass. Check out our before and after pictures from various clients from Enfield and Barnet that we have served in 2019. Window repairs made affordable with Misty Glaze.